I've been searching for a project to carry me through this Winter and next Spring, until I can start construction of the new workshop. I've been considering all kinds of ideas and its clear I cannot get too involved with a lot of detail until I can truly park a building jig on a workbench long term. That said, I have "modeled" in one form or another for decades, and it struck me that what model shipbuilding lacks is a lot of radio control capable tall ships...there are plenty of beautiful scale kits out there, but who would really put the time and money into a scale 74 Gunner, then try and convert it to RC?? 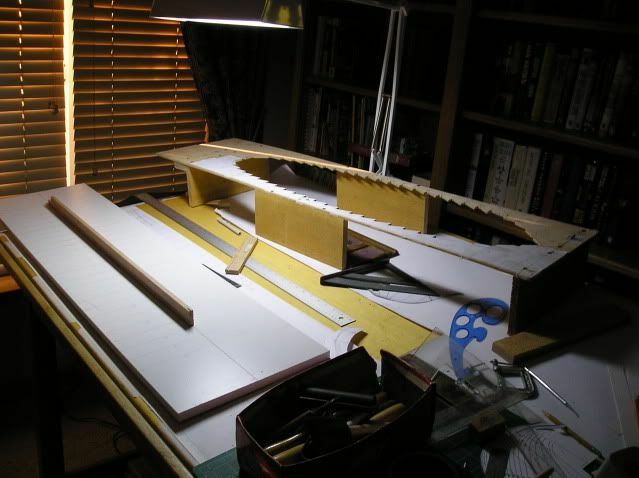 Nearly impossible in any case because the hull interiors are inaccessible once the model is finished. Believe it or not that is a scratch built plank on frame model, such as it is. The hull resembles one of Nelson's as much as the RC flying lawnmower resembles an airplane...but the "Lady Love" has won four regattas and it does have some very interesting sail control features that would make sailing possible if the hull were up to the task...unfortunately it is not. However, he has some interesting ideas about repeatable-firing cannons that is worth considering as well as some control features....but the hull just can't take proper advantage because of its design. 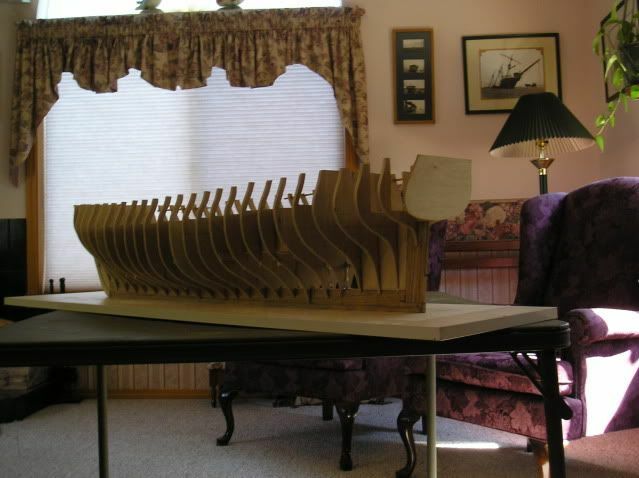 It occurs to me that it would not be difficult to take a solid hull design, replicate it with 1/4 inch plywood framing, plywood and hardwood planking, modern adhesives and even a bit of epoxy resin fiberglass. One could hit the major points of the deck gear and standing rigging without getting overly messy, and provide enough R/C running rigging to get the ship to sail. 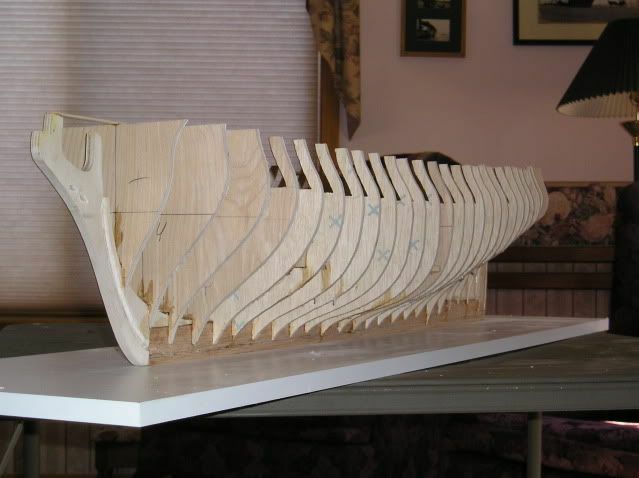 Building a solid hull that has room for proper ballast and RC sail winches is not that difficult to envision, and if your intention is not to try and duplicate any particular vessel, but make a ship that will in fact sail, this project is suddenly very attractive. I've been collecting a lot of reference material on 18th Century British hull designs, as that era is considered "state of the art" for wooden warship hulls, and one of the very best books I've picked up on Amazon is "Architectura Navalis Mercatoria", Fredrik Hendirk Chapman's amazing treatise on 18th Century naval architecture, originally published in 1756, but available in paperback on Amazon at a reasonable price. I have to do some figuring about how to make space for everything, but I'm pretty sure I can find a way to get access into the hull while keeping it water tight underway. There are innumerable techniques to do something like this and the whole idea has me intrigued enough to give it a try. Ain't those some sweet lines??!! She is indeed a shapely lass Bob. Have you commenced the building at this time? I'm a ways off from making any sawdust on this one 6pkrunner...right now I'm making plenty of eraser dust on my drawing board, and probably will be for a while yet. I've gotten a good start drawing the after templates and beginning to figure out how the innards are going to be configured; especially how to take advantage of that deep "V" hull for ballasting later on. 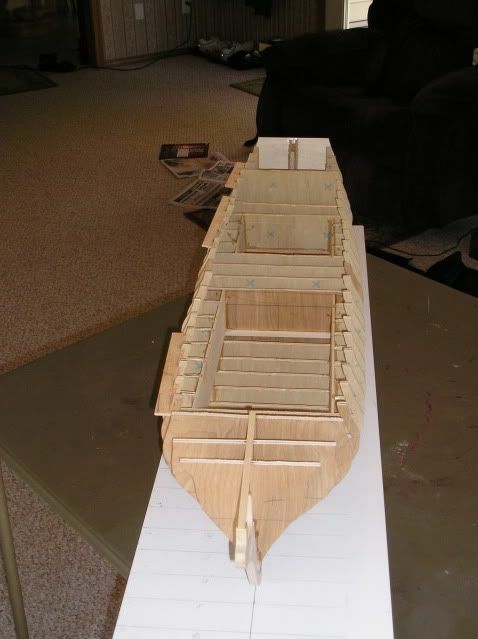 I want to double plank the hull; the first layer would primarily be 1/16" plywood strips and some hard balsa strips, firmly glued and secured to the 1/4" plywood frames. 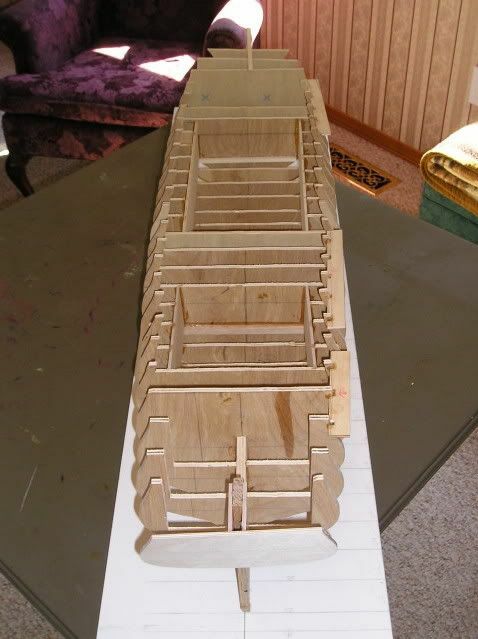 I plan to bond the plywood strips from the garboard strakes to at least the turn of the bilge with epoxy, and brace the inside with floors and internal bilge keels as necessary. The second layer would be some kind of 1/16" hardwood bonded to the 1st layer and finished with a clear waterproof product. 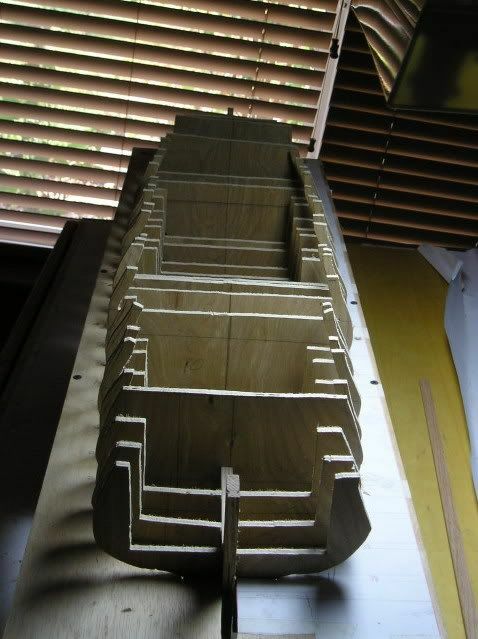 Instead of cant frames up forward I will use balsa blocks, but the stern should plank out nicely as is. I'm still not decided about painting the bottom copper colored. I'm working on how to simply and effectively anchor all three masts, and provide room inside to build support for removable deck sections. It has to have access inside, and that really isn't that hard to do if the model is framed correctly. 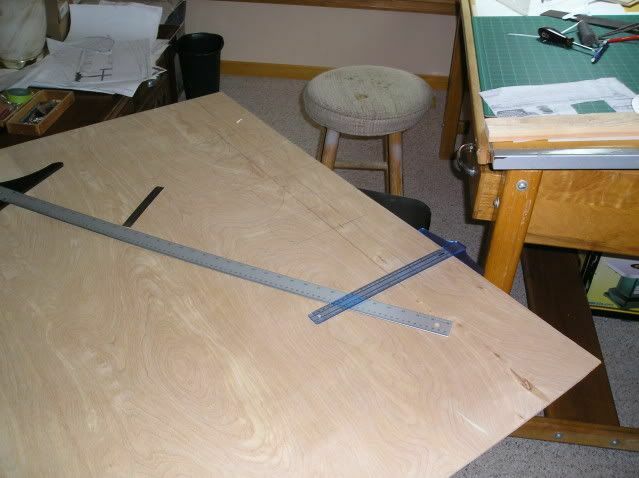 What I am seriously considering is making some of the key frames into properly sized foamboard to test the integrity of what I want to accomplish, before making the parts from wood. 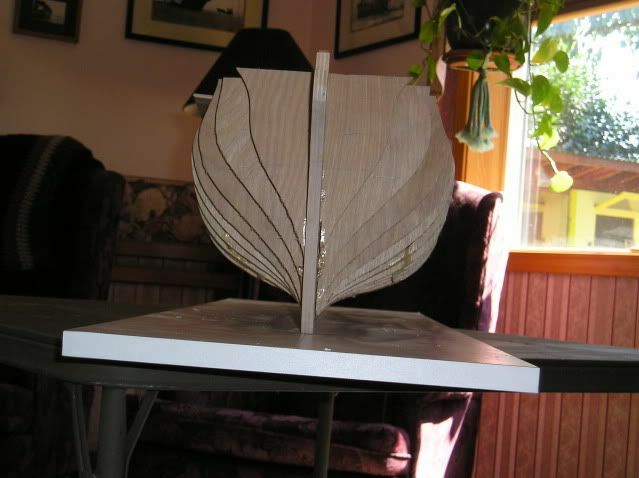 If it will fay together in foam, the plywood will be a snap, and foamboard is a lot cheaper than decent 1/4" plywood. I've got some ideas about how to provide some permanent and some removable ballast, and I think the foamboard would be an enormous help in figuring those issues out. I have to keep stopping and reminding myself to "K.I.S.S." on these drawings and not to get too buried in a lot of detail that does not really matter, and does nothing toward making the hull sail better. I'm pretty sure I can produce a fairly accurate scale profile of that hull, and once I do fitting the gear into it won't be that much of a stretch. Your build would be very interesting to follow from The RC perspective. Please take photos of your progress and post. Hi Dan, and yes, I'll get a bunch of photos posted here soon. I've managed to make significant progress on this project and I've kept my digital camera handy. I was out and about today and stopped by the Michael's craft store in Portland (OR) for plywood and hit the jackpot. I needed a good slab of 3/8" birch ply, and not a hobby store in town had any. It isn't easy to find online either. But Michael's had excellent quality 7 ply birch in 3/8" by 1' x 2' sheets. They also had a bunch of 1/8" which I needed as well, so it was a productive run. 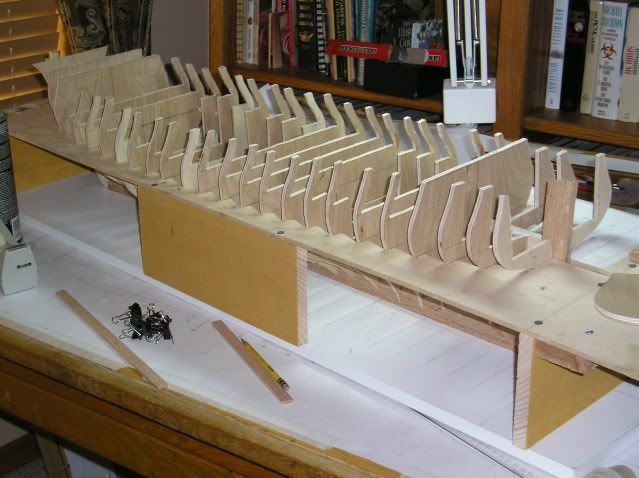 In any case, I am close to having the keel done and ready to screw down to the building board, and I have the assembly jig roughed out and almost ready to install too. 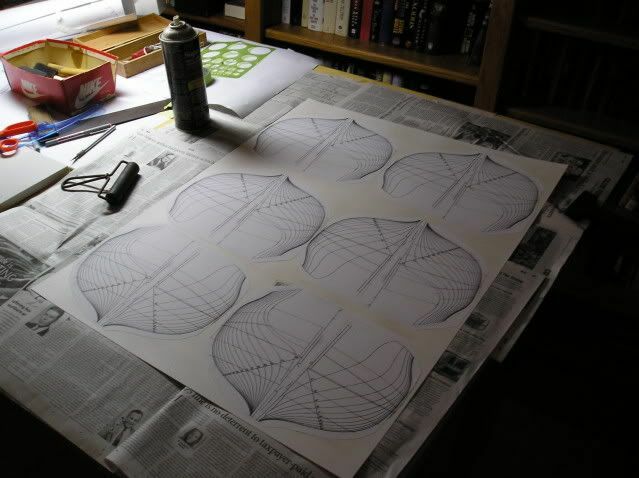 I have begun laying out and cutting the individual bulkheads. I'm doing it all in batches so I don't skip a step on any one piece. There are 14 aft formers and 16 or so forward ones. I'm laying them all out on plywood planks, then taking them out to the bandsaw and rough cutting them apart, then fine tuning the cuts so they are ready for the sander. My trusty 16" Delta scrollsaw is down for maintenance while I send the top and bottom connectors off to have a set of quick blade disconnects made for it. It's a pain in the posterior to chance a blade on it and it will be worth a few bucks to get a decent blade holder for it that actually holds a blade. I had to dismantle the arms on it so I'm cleaning the whole machine and putting it back together again with fresh grease. Thanks for moving this thread! 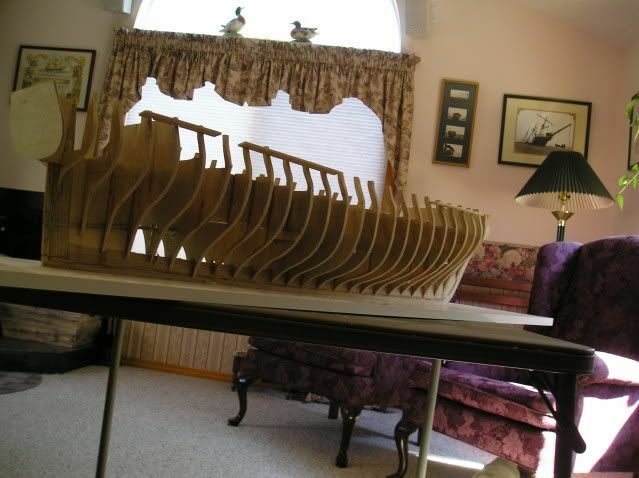 To start off the project, I made enough copies of the scaled up hull lines as there will be bulkheads, and using spray adhesive, glued them all to heavy poster board. I use a hard rubber roller to really stick them down good. I marked the widest point on the original and will transfer that line to all of the forms. That line represents the top surface plane of the jig, and I will make it according to those red lines and how wide the hull is at that point. 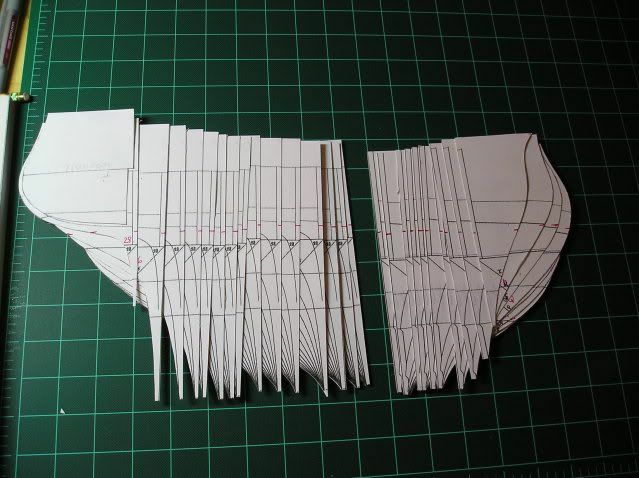 I used a new #11 Exacto knife to cut all of the individual forms out. I marked the widest point on each one in red. I also figures where I wanted the deck supports and the radio boxes to be in red on each template. I'm using an inexpensive but well made 1/4" 3-ply for the bulkheads. 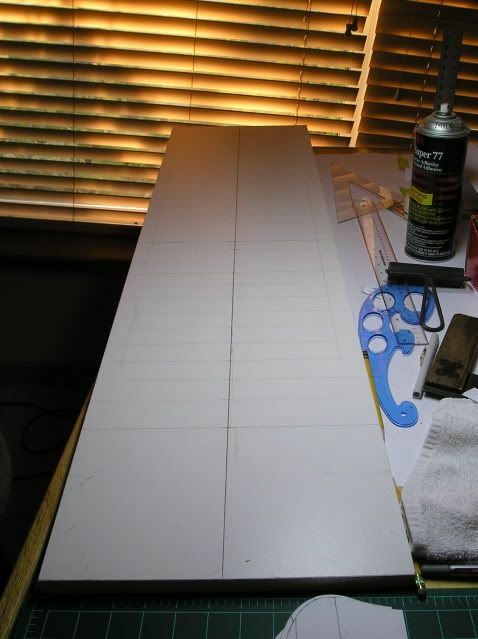 I took a 4' x 4' sheet and cut it into 10" wide strips, and laid out all of the bulkheads. 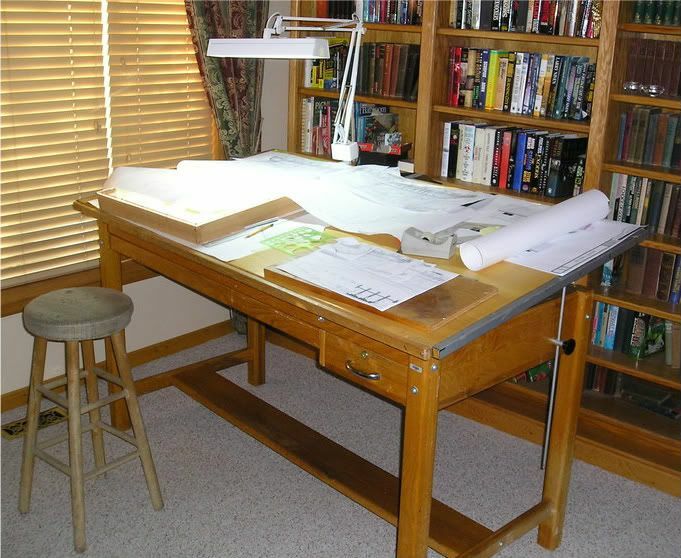 First I drew a centerline on each strip of ply, and marked out all of the elevations and drew those in with a T-square. 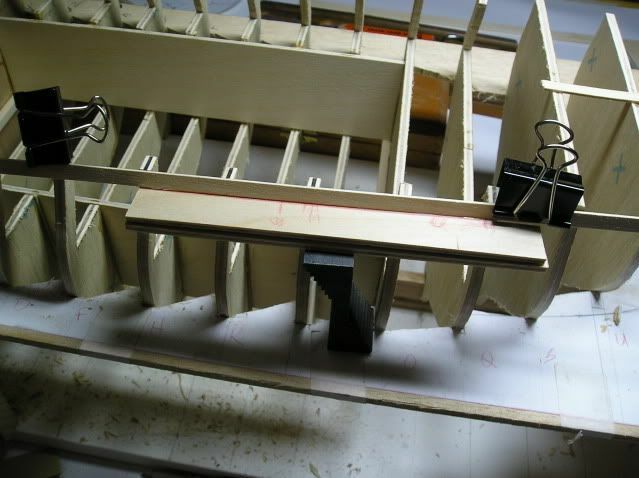 That made it easy to accurately match up each side of the bulkhead from the 1/2 template. It took some real doing to come up with a side profile that was reasonable accurate to the original, but my lightbox served me will and once I had the profile, I extended all of my bulkhead lines up, and based on the maximum width line I mentioned earlier, marked out the positions on the pattern, then glued it on two pieces of 6" plywood, taped face to face for the building jig. I carefully cut it out on the bandsaw, and after mounting the halves together, I ripped pieces of cedar board to the proper width to position to top plane of the jig at the height of the red max width line. I scored a centerline on a 4' melamine covered shelf board, and drilled three holes on the centerline. I marked those on the bottom of the Oak keel (1 1/4" x 3/8") and test fit it to the building board. 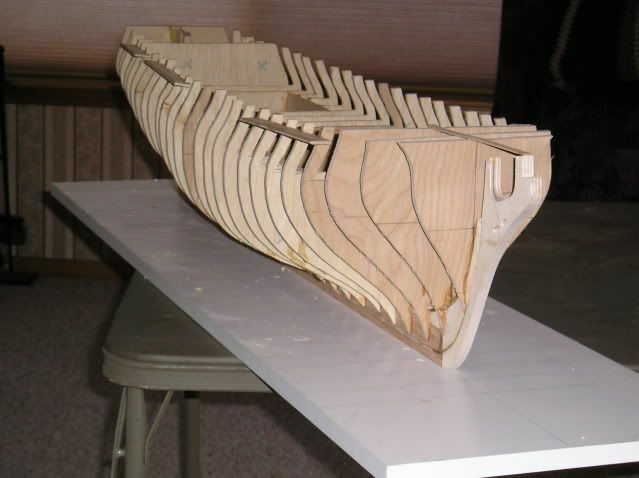 I spent several hours on the bandsaw rough cutting all of the bulkheads. I cut the radio box cutouts on the bandsaw as the wide blade does straight lines very well. The outside profiles were cut close to the lines and made ready for the sander. 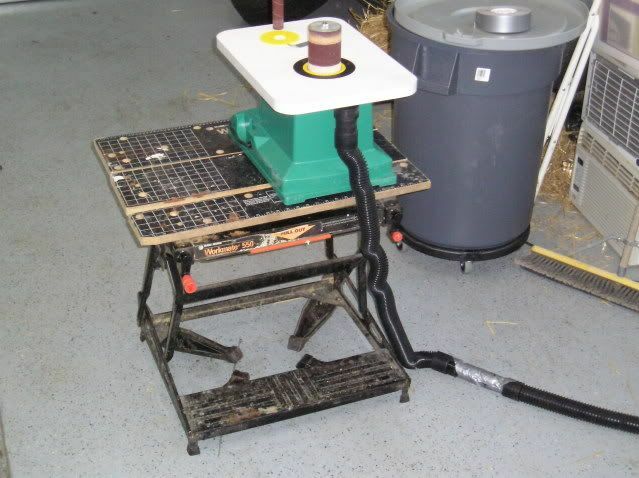 This is why I am building a new workshop next Spring....I set up the sander on my Workmate in the garage, and attached my small shopvac to it and was all set for sanding. The Grizzly sander works extremely well, and I used the large diameter spindle for everything but the small inside curves on the aft most bulkhead. A little sanding makes a big difference, huh? Considering that I am working off of a single sheet out of a book, enlarged some 400% and drawn by hand, I think the hull is coming along just fine. Not surprisingly, there are a few inaccuracies due to the copier, or my inconsistency in cutting, or simply letting my pencil get too dull and the lines a bit too thick. Since this isn't a kit with die cut parts, I expect to do quite a bit of adjusting as I go. With that in mind, I am using thick CA and 5, 15, and 30 minute epoxies that I like to thicken with micro-balloons until the epoxy is the consistency of peanut butter. 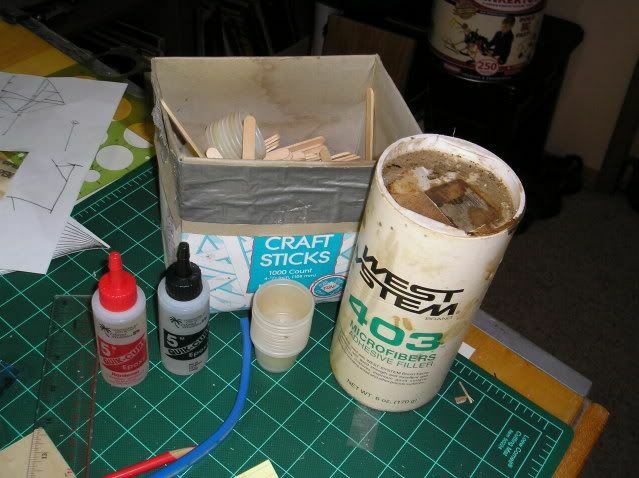 I keep a box of popsickle sticks and 1 oz plastic cups to mix epoxy, and you can never have too many of either. Thick adhesives cover a number of sins, and on a build like this one they come in very handy....I'm using them in the above pic to install one of the channels so it is parallel with the deck. I have a pair of small, stepped parallel blocks that I use in my modeling constantly. I'm using them to help hold the bulkheads against the jig as I glue each of them in place. And that is where we stand at the moment. She is 40" vertical to vertical, and not quite 10 inches wide at the widest point. I have a lot of work ahead of me of course, but I am very please with where the hull is right now. 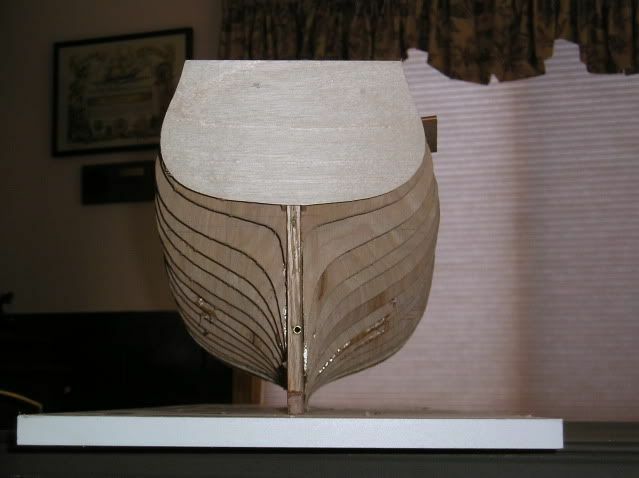 Once I can do some sanding, shaping and adjusting of the lines she will be ready for some initial planking. I need to get the mast steps into place next and that will take some doing...the original drawing stops at the top of the side rail, but it shows where the masts go. 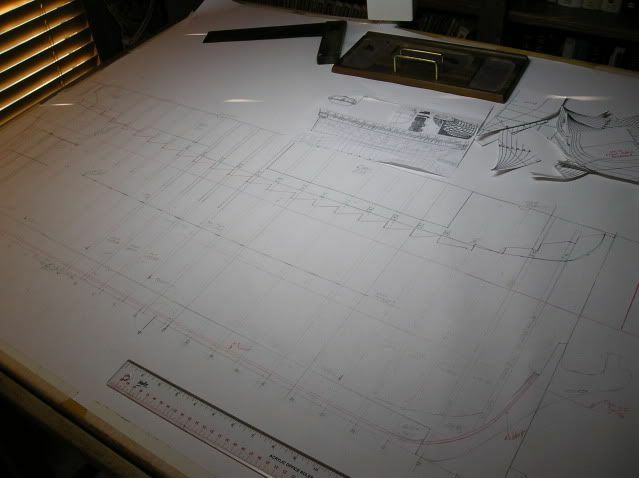 I have to do another drawing set for the masts, as the plans (thankfully!) show all of the deadeyes and the angles they are mounted. Extending those lines will give me the height of the lower masts and I can go from there to product mast sets that are reasonably accurate. The hull is a scale profile of a design that is almost 300 years old, and I am pretty pleased with myself for getting this far this quickly. I am quite sure that I will be able to get the controls I need into the spaces I have made in the hull, and most important, I'm having a lot of fun along the way. This isn't a simple project to take on, and it is very easy to get buried in minutae if you're not careful. The goal is to see this ship out on the lake next Spring, and I'm well on my way there. Man when you start a project you go full steam. Looking good. I have found the 4' section at Michaels to a great place to find plywood.